Hyperlocal weather app Dark Sky is a favorite for many smartphone users – the caveat, of course, being that it was only available on iPhone and iPad. Today, that finally changes. 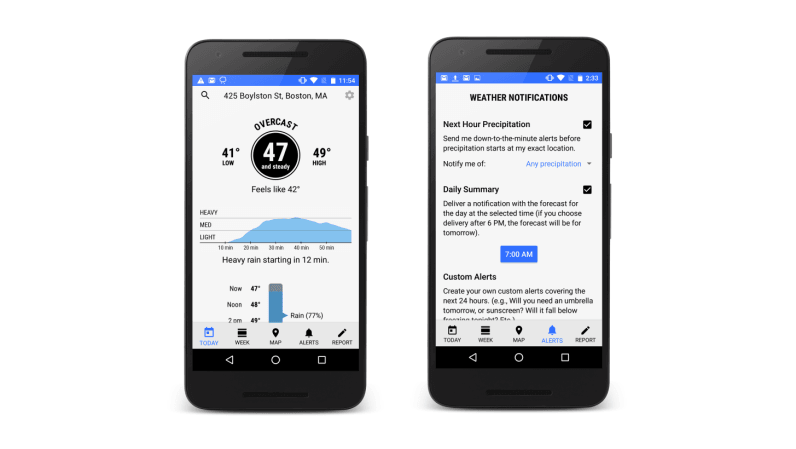 Yep: Dark Sky for Android has landed, and will bring you all the major features such as next-hour notifications, by-the-minute rain forecasts, doppler maps, and 24-hour/7-day forecasts. The pricing model for the Android counterpart is different, however; unlike the iOS app which costs $3.99, the Android version is free to download. Instead, Android users can upgrade to a premium version for $2.99 a year to get up to the minute forecasts. They can try the paid version for a free two-week period, though. The Android app also brings home screen widgets, such as next hour, today, or weekly forecasts, for quick glances at the weather. In the long run, it seems like Android users will end up paying more for the app than their iOS friends – but the developers are calling this pricing mechanism an “experiment” for time being. Dark Sky for Android is available now on the Play Store, but support is only for US, UK, and Puerto Rico at launch. Read next: Ex-cop Uber driver allegedly kidnapped passenger... How the hell is this still happening?